When I'm going to make great ribs, Smithfield Tender Backs are my secret weapon. You can't go wrong with their hand-trimmed, extra tender and juicy ribs with no added hormones or steroids. 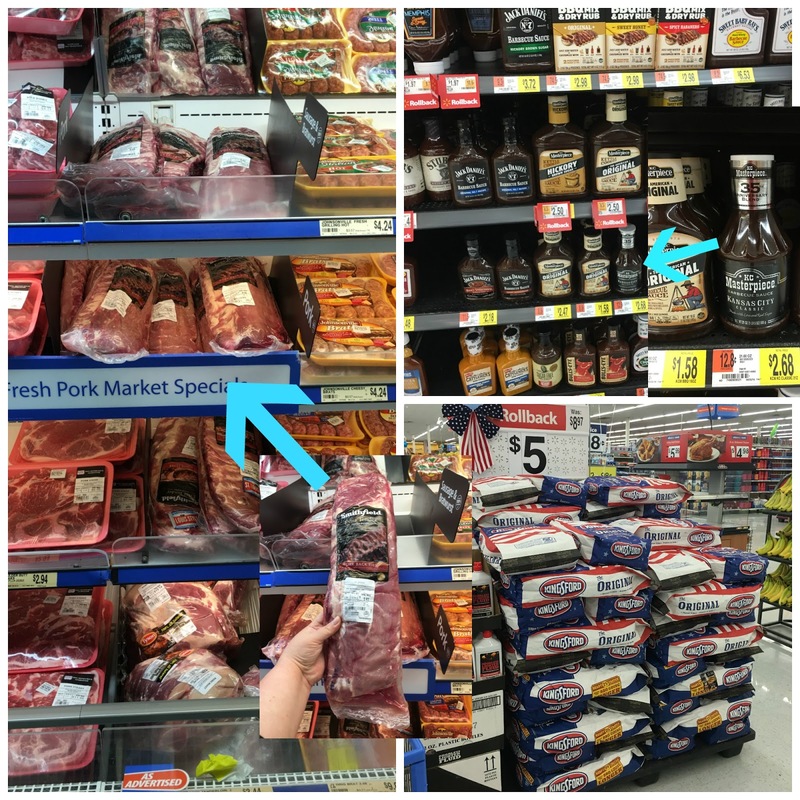 I pick my ribs up from the pork section of the meat department in my local Walmart, grabbed some KC Masterpiece barbecue sauce, and some Kingsford Charcoal. Next it was time to get home to get this backyard BBQ started! To begin you will need to remove the rack of ribs from the packaging and pat it dry with a paper towel. To make them a little more manageable for grilling, I like to cut my rack of ribs in half. Now rub a thin layer of mustard all over the top side of the ribs. This will help to tenderize the meat, as well as give it some great flavor. Speaking of flavor, we are going to make a delicious spice run for our ribs, so combine the brown sugar, smoked paprika, salt, pepper, oregano, garlic powder, and onion powder in a small bowl. Now LIBERALLY sprinkle the spice run on the top half of the ribs and rub it in (hence the name spice RUB). Now flip them over and LIBERALLY season the bottom half of the ribs. Okay, so this where I am about to BLOW YOUR MIND! So often we fall into the trap of thinking that great ribs have to cook low and slow for HOURS on end to get great flavor. 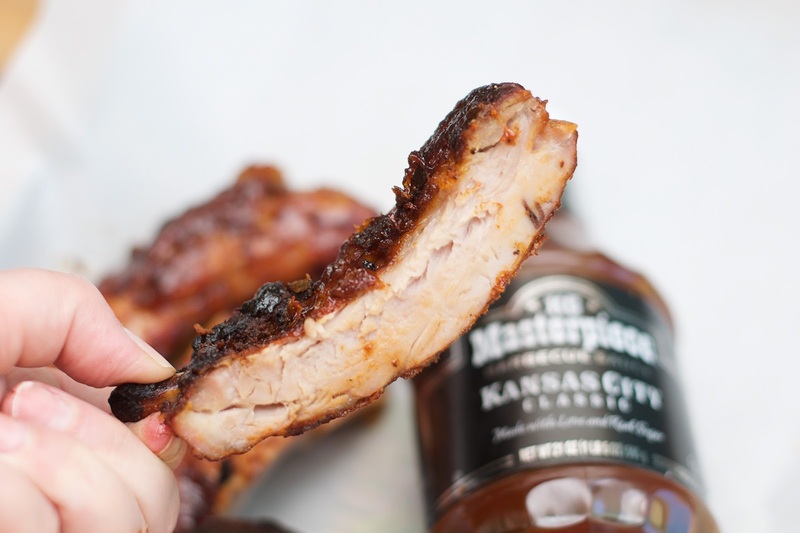 I'm here to tell you that you can have these ribs done and on your table in ONE HOUR! Yes ONE HOUR! The trick is to fully cook the meat on the grill in a foil pouch, THEN caramelize it on the outside with the sauce. Get TWO sheets of HEAVY DUTY foil and place them on top of one another. Spray the top sheet with some cooking spray. Place the seasoned half rack of ribs, top side up, on the foil. Fold the foil around it into a packet. And to make sure none of the juices leak out on to your charcoal and cause nasty flair ups, fold the second piece of foil around the first to form a second packet around it. What's going to happen is the fat on the pork is going to melt and essentially steam the meat, creating the most tender and juicy ribs you have EVER put in your mouth. Place the foil packets into the refrigerator to marinate, and head out to get the grill ready. Remember when I told you that you didn't have to have any fancy equipment for this recipe? Well, I wasn't lying. Tp prove it, I purchased this inexpensive charcoal grill from Walmart ($19.99). Then, I picked up the only charcoal we will use in this house, Kingsford Charcoal. Follow the instructions for lighting the charcoal on the back of the bag. Give the charcoal about 15-20 minutes to get covered with a nice, white ash color. Now place the grate over the hot charcoal and place the packets on the grate. Before you ask, NO, you don't have to move the charcoal to one side, and cook over indirect heat, and NO you don't have to have a drip pan. Just place the rib packets directly over the heat. Close the lid of your grill and let them cook for 50 minutes. After 50 minutes you can remove the ribs from the foil. The meat will be fully cook and the rub infused into the meat. Now place them top side down on the grill and add some KC Masterpiece BBQ Sauce to the bottom side of the ribs. Brush so that the entire bottom of the rack is covered with the sauce. Cover the lid, and let it cook for 5 minutes. Now flip the ribs over. See how they have already started to caramelize? Now brush the top side of the ribs with the delicious sauce! And now you are ready to eat! Look at this beautiful rack of perfectly cooked BBQ Smithfield Pork back Ribs. Tender, juicy, full of flavor. And can we talk about that KC Masterpiece sauce for a minute? Sweet, spicy, tangy, sticky goodness! EVERYTHING you want in a great rib sauce. And look at how juicy and perfectly cook they are! No one will believe that you did this over a $20 charcoal grill in an hour! So don't let the idea are barbecuing intimidate you this summer. Head to Walmart, pick up your Smithfield Pork Back Ribs, KC Masterpiece BBQ Sauce, Kingsford Charcoal, etc and give this fool proof recipe for How To make Perfect BBQ Ribs on a Charcoal Grill Recipe a try! And as if the recipe isn't great enough, with all of your new found grilling skills you are definitely going to want check out The Hogwild Smithfield Throwdown! It's a fun contest Smithfield is having with LOTS of great prizes! Pat the rack of ribs dry with a paper towel. Cut the rack in half. Rub both halves with dijon mustard. Combine the smoked paprika, brown sugar, garlic powder, black pepper, onion powder, salt, and oregano in a bowl. Sprinkle LIBERALLY over BOTH sides of the ribs. Get TWO pieces of foil. Spray the first one with non-stick cooking spray. Wrap the first piece of foil around the ribs, into a packet. Now wrap the second piece of foil around the rib packet and place in the refrigerator. Preheat your grill. Add charcoal to the grill and light according to the instruction on the bag. Let the charcoal heat until it is covered in a white ash. Place both rib packets on the grill, close the lid and let cook for 50 minutes. After 50 minutes remove from foil and place top-side down on the grill. 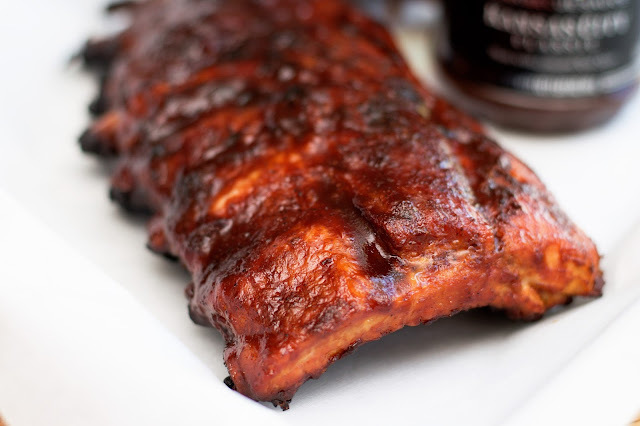 Brush BBQ sauce all over the bottom of the ribs, close the lid, and let cook for 5 minutes. Flip the ribs, brush the top side with the BBQ sauce, close the lid, and cook for 5 minutes. Those look awesome. 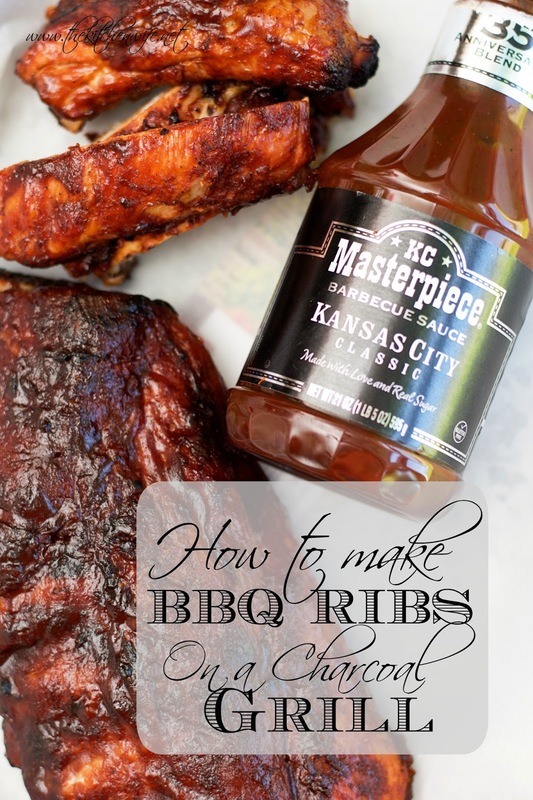 You definitely need a good sauce for ribs! YUUUUUM! Yum. I love Summer bbq season! Oh your step by step tutorial is just what my bestie needs for his first ever cook out he is hosting next weekend. YAY! I hope she finds this super helpful! WoW, this was so helpful and loved the step by step tutorial. The Ribs look so juicy n delicious. i dont eat pork..but this looks soo good. I love this recipe; used it today. I slightly altered the plan. I poked holes in the top of the foil packet so the ribs could capture more of the smokey flavor; I didn't have smoked paprika. It took 30 minute (thin rib sections) to 45 minutes longer to cook to get the ribs "falling off the bone done," but the flavor made it worth it. And, I only had to fill my chimney starter once--no adding more hot charcoal to get it done. I used a generic barbecue sauce, but the ribs were the best I ever cooked. Thanks for the step-by-step tutorial and pics. Hi Leslie! So glad you like this recipe. Sorry for the time difference, but sometimes grills and cuts of meat factor into that. I will make a note of it on the post! I tried your trick with wrapping my beef ribs in double foil and they came out great and yes just like you i used my $20 grill to which i am always grilling up something. Awesome! I am so glad this worked out for you!!!! Best ribs I ever cooked. So fast and easy ,,,, didn't have to stay there and watch them. EVERYBODY LOVED them. AWESOME!!!! I am so excited to hear that! Thanks for sharing!!! What temperature does the grill need to be? When I'm grilling with charcoal, I usually just put it on when the coals are white. I didn't really clock a temperature. Just made these tonight instead of my 6 hour smoke session. They came out great and my kids loved them. I will be using this recipe in the future when I need to cook and are compressed for time. I'm so glad to hear that! Thanks so much for sharing!! I made them last night and they were awesome! Thanks for the recipe. Thank so much for your comment and for trying the recipe! I am SO glad you enjoyed it! That's great! Thanks for letting me know! I bet that sauce was fantastic! You could taste the alcohol!! Lol! I have no idea how to cook most things on the grill without completely charring them, so this is SO helpful!! and they look INCREDIBLE!! omg I can't wait to try this! Thanks Nicole! Grilling is an art for sure (one I have yet to master), but anytime I find great tips to make it easier I am always excited to share! I was able to make 3 racks of these ribs for my family this weekend. They turned out nice and tender! I would also suggest that when preparing the ribs is to make sure that the membrane on the bottom side is stripped away. It makes it much easier to eat. Thanks for the time saving recipe! That's fantastic Mark! And thanks for the time! I will 100% be sure to do that next time! It truly worked. This summer was too hot to cook inside and while I did not use your rub seasoning I used a store brought one with sweet baby rays bbq sauce it was amazing technique. Thanks so much for the post. That is AWESOME! I'm so glad to hear that! And yes, I like to experiment with different rubs and as sauces as well! Thank you so much for sharing! I don't know what he did wrong, but my husband burned the rack! The edible part was good tho. Needless to say he is permanently demoted from BBQing!! I bet that was his plan the whole time! OH NO! I'm sorry to hear that! Give him a little grace though. I hope that you will try these again! Hi Mandee - My boyfriend Ed and I were pressed for time last night. I stumbled across your website when I was searching for "how long bbq ribs cook on the grill". We already have our little $20.00 charcoal grill, all we needed was a quick way to cook ribs. Than you for sharing. 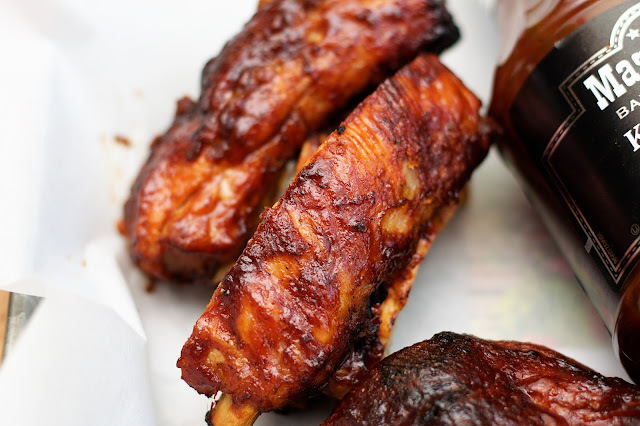 We used your way of cooking ribs on the grill step by step. They were the BEST bbq ribs we have ever had!!! Thanks. So excited to try these tomorrow night! Question- would regular mustard work, or is it super important to stick with Dijon? Normally I cook my ribs in the oven in a method similar to this and due to a lack of a grill. While on vacation I did not have access to an oven and was worried how I was going to make my ribs. I came across your method. The ribs turned out great. Thanks. Hey Walt! I am so glad to hear this! Thank you so much for taking the time to comment and let me know! Lordy!!! This was such a great, quick, easy recipe....and the ribs were the BEST I've ever made! Meat fell right off the bone. The step-by-step tutorial was so helpful. Thanks for a recipe I am SURE to use again and again! Thank you so much! I really appreciate you coming back to comment! Used this recipe last night and the ribs were fantastic! So easy and delicious. I made these ribs today exactly as specified. TOTALLY amazing ribs. This is my go to from now on. That is so exciting to hear! I'm so pleased you liked the recipe! Thank you so much for stopping by!